Everyone benefits from exercise, but when dealing with individuals, we must consider preferences, experience and comorbidities. We must make ‘every contact count’. Although physical activity promotion is a government, local and community wide role, this section will focus on the physical activity for physiotherapists and health professionals who have regular contact with patients, and the opportunities associated with these interactions. According to Orrow, et al, for primary care practitioners to successfully encourage one person to meet the ACSMs guidelines of 150minutes per week, the number needed to treat (NNT) is 12. Physical activity knowledge and promotion amongst Australian physiotherapists is poor (Freene, Cool & Bisset, 2017) and physiotherapists in the UK have a poor knowledge of the guidelines. 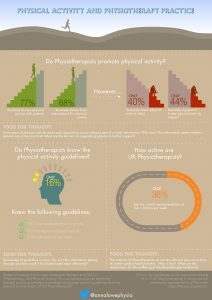 So how should we encourage patients to become physically active? This approach is the opposite of acting purely from a clinician-centred approach which can be concerned with meeting health indicators (i.e. blood pressure) that may fail to consistently motivate our patients where immediate results are not noticed. When physical activity goals are recognised, they can act to strengthen the behaviour and how PA is perceived and experienced. Here is a great booklet to be able to give to our patients by Exerciseworks! "Training tomorrow’s doctors, in exercise medicine, for tomorrow’s patients"